Beat egg yolks, sugar and salt together until thick and light in color. Heat milk with vanilla bean, if using, until very hot. Add to the eggs and sugar in a slow, steady stream. Pour back into pan and cook over medium-low heat until it reaches 170-180 degrees F. (Be really careful not to let it curdle!) Pour through a sieve into a clean bowl. Add the cold cream and vanilla extract, if using. Chill for at least 3 hours or overnight. Or to speed up the chilling process, use an ice water bath. * Churn in an ice cream maker according to manufacturer directions. Divide the ice cream between 10-12 small freezer-proof bowls or ramekins, leaving a little space at the top. Press a bit of waxed paper on the surface to make it smooth and flat. Transfer to the freezer. 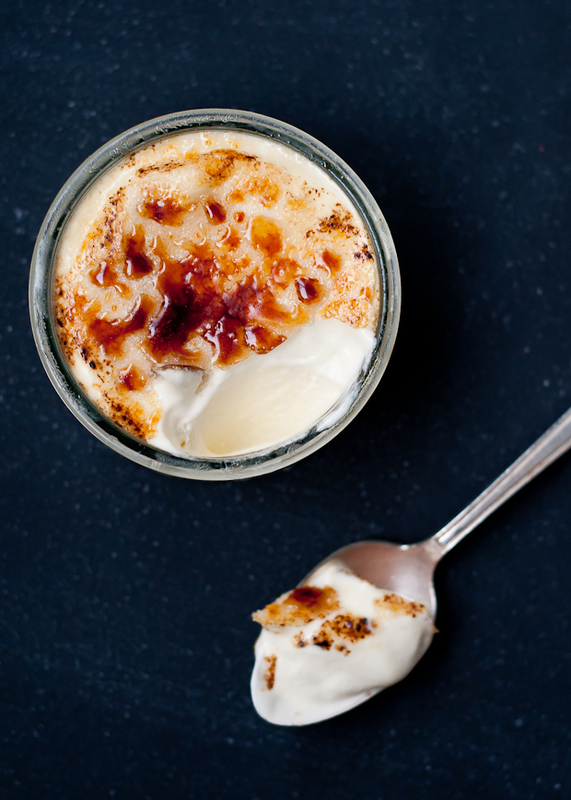 Remove ramekins from the freezer about 10 minutes before serving and allow to soften a bit at room temperature. Sprinkle top of each ramekin of ice cream with 1 tsp. raw sugar. Use a torch to caramelize the sugar. Serve.